Comments: This nebula has only recently been discovered. It was first spotted by amateur astronomer Dave Jurasevich in California on 6 July 2008. Officially known as PN G75.5+1.7, the Soap Bubble is an example of a planetary nebula. These are formed when the nuclear fusion reactions at the centre of a star can no longer support its structure. External layers of the star are forced outwards, drifting through space for thousands of years. These gases are ionised by ultraviolet light from the remaining core and glow, resulting in nebulae that take on a variety of shapes and sizes. 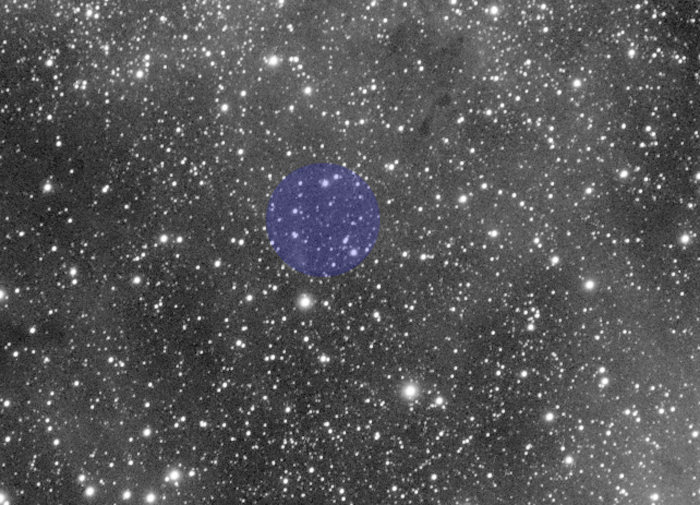 Most are elliptical or cigar-shaped, but the Soap Bubble Nebula is a rare sphere. The nebula is very faint & I was suprised to capture it from my light polluted location in Bromley. Even with 4hrs of exposures the bubble is barely visible.